Is Ralph Lauren Corporation (NYSE:RL) a good stock to buy right now? We at Insider Monkey like to examine what billionaires and hedge funds think of a company before doing days of research on it. Given their 2 and 20 payment structure, hedge funds have more incentives and resources than the average investor. The funds have access to expert networks and get tips from industry insiders. They also have numerous Ivy League graduates and MBAs. Like everyone else, hedge funds perform miserably at times, but their consensus picks have historically outperformed the market after risk adjustments. Ralph Lauren Corporation (NYSE:RL) has seen an increase in enthusiasm from smart money in recent months. Our calculations also showed that RL isn’t among the 30 most popular stocks among hedge funds. In the eyes of most market participants, hedge funds are perceived as underperforming, outdated investment vehicles of years past. While there are more than 8000 funds with their doors open at the moment, We choose to focus on the bigwigs of this group, approximately 750 funds. Most estimates calculate that this group of people preside over the lion’s share of all hedge funds’ total capital, and by watching their unrivaled investments, Insider Monkey has brought to light numerous investment strategies that have historically exceeded the market. Insider Monkey’s flagship hedge fund strategy outpaced the S&P 500 index by nearly 5 percentage points annually since its inception in May 2014 through early November 2018. We were able to generate large returns even by identifying short candidates. Our portfolio of short stocks lost 27.5% since February 2017 (through March 12th) even though the market was up nearly 25% during the same period. We just shared a list of 6 short targets in our latest quarterly update and they are already down an average of 6% in less than a month. Let’s view the fresh hedge fund action encompassing Ralph Lauren Corporation (NYSE:RL). How have hedgies been trading Ralph Lauren Corporation (NYSE:RL)? Heading into the first quarter of 2019, a total of 31 of the hedge funds tracked by Insider Monkey were long this stock, a change of 11% from one quarter earlier. 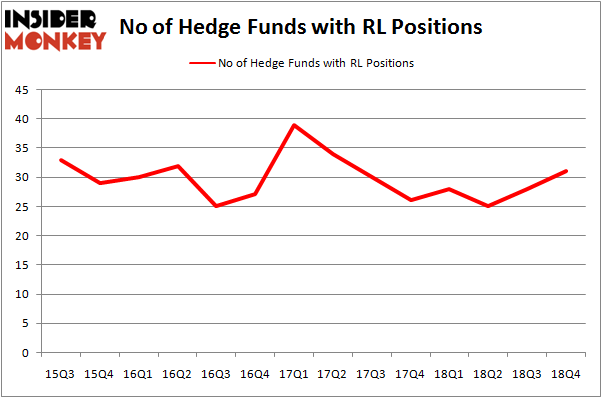 The graph below displays the number of hedge funds with bullish position in RL over the last 14 quarters. With hedge funds’ positions undergoing their usual ebb and flow, there exists a few noteworthy hedge fund managers who were increasing their holdings considerably (or already accumulated large positions). More specifically, Renaissance Technologies was the largest shareholder of Ralph Lauren Corporation (NYSE:RL), with a stake worth $371 million reported as of the end of September. Trailing Renaissance Technologies was AQR Capital Management, which amassed a stake valued at $192 million. Two Sigma Advisors, Maverick Capital, and Marshall Wace LLP were also very fond of the stock, giving the stock large weights in their portfolios. Now, some big names have been driving this bullishness. Marshall Wace LLP, managed by Paul Marshall and Ian Wace, created the largest position in Ralph Lauren Corporation (NYSE:RL). Marshall Wace LLP had $19.4 million invested in the company at the end of the quarter. Glenn Russell Dubin’s Highbridge Capital Management also initiated a $10.1 million position during the quarter. The other funds with new positions in the stock are Sara Nainzadeh’s Centenus Global Management, David Keidan’s Buckingham Capital Management, and Mike Vranos’s Ellington. Let’s now review hedge fund activity in other stocks – not necessarily in the same industry as Ralph Lauren Corporation (NYSE:RL) but similarly valued. These stocks are Jacobs Engineering Group Inc (NYSE:JEC), United Rentals, Inc. (NYSE:URI), Torchmark Corporation (NYSE:TMK), and Dropbox, Inc. (NASDAQ:DBX). All of these stocks’ market caps are similar to RL’s market cap. As you can see these stocks had an average of 33.75 hedge funds with bullish positions and the average amount invested in these stocks was $662 million. That figure was $754 million in RL’s case. United Rentals, Inc. (NYSE:URI) is the most popular stock in this table. On the other hand Torchmark Corporation (NYSE:TMK) is the least popular one with only 19 bullish hedge fund positions. Ralph Lauren Corporation (NYSE:RL) is not the least popular stock in this group but hedge fund interest is still below average. This is a slightly negative signal and we’d rather spend our time researching stocks that hedge funds are piling on. Our calculations showed that top 15 most popular stocks among hedge funds returned 19.7% through March 15th and outperformed the S&P 500 ETF (SPY) by 6.6 percentage points. Hedge funds were also right about betting on RL, though not to the same extent, as the stock returned 16.7% and outperformed the market as well. Did Hedge Funds Drop The Ball On Kansas City Southern (KSU) ? 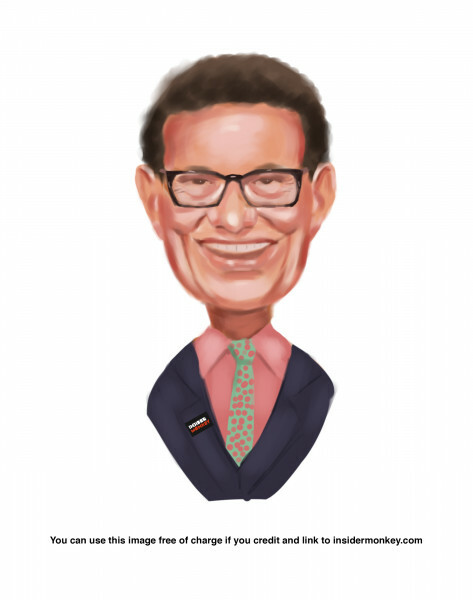 Here is What Hedge Funds Think About Jack Henry & Associates, Inc. (JKHY... Here’s What Hedge Funds Think About The Gap Inc. (GPS) Here’s What Hedge Funds Think About IDEX Corporation (IEX) Were Hedge Funds Right About Flocking Into Altice USA, Inc. (ATUS) ? Were Hedge Funds Right About Souring On WestRock Company (WRK) ?